Shrill follows Annie (SP?) played by Aidy Bryant as she lives her life as a plus size lady. She deals with parents, sexual partners, and workplace woes. As it does for plus size folks, her weight comes into play in all aspects of her life. One of the things that stood out the most to me, was seeing Annie sneaking in and out of Ryan’s (Luka Jones) house after sleeping together. He makes it pretty clear that he doesn’t want his friends to meet her, and that just feels cruddy. It’s crap to be a part of, and it’s garbage to watch. My mum always told me that someone who doesn’t want to people to know you’re together is no good, and she’s not wrong about that. It was also hard to see her shot down consistently at work. Her weight is a factor both in insurance discussions, and in comments (as she works for an online newspaper), and it was so difficult to see someone be chastised for their body there. All of this show was difficult to watch. But it was so satisfying when Annie started doing what she wanted, when she wanted. She’s a pretty dang cool character, and I hope we see her conquer more in a second season. 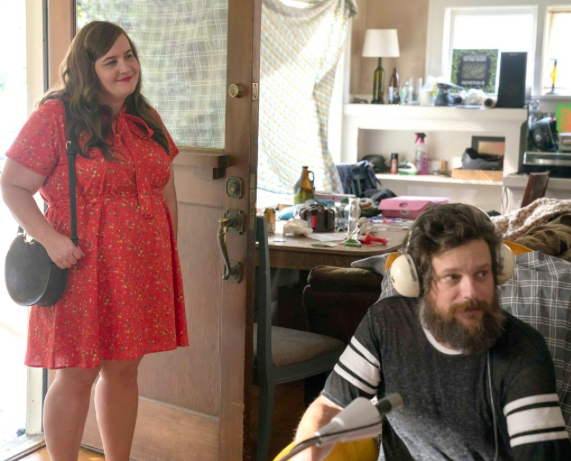 If you haven’t already, I highly suggest you check out Shrill on Hulu. If you don’t have Hulu, c’mon over and we can binge it together.